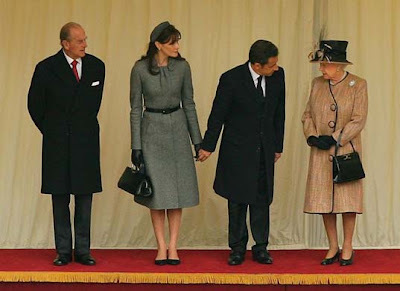 Check out the recent photos of the Sarkozy’s well-publicised trip to Great Britain. Carla has been dubbed “Carla Jackie Bruni–Sarkozy” by the French press for her not very subtle “Jackie O” sartorial choices, which include the questionable use of pillbox hats. Frankly I find her clothes really blah – the French must never relinquish their glamour in my opinion. I’ll bet the British public, not to mention that famed womanizer Prince Philip, were rather disappointed after being treated to, thanks to those salacious British tabloids, photos of Carla in all her naked glory earlier in the week. She also looks to me like she could be pregnant. In France, Sarkozy does a good job of avoiding being filmed or photographed on a level surface with other people. This is because, as you can see above, he is shorter than most of them. We had dinner last week with a friend of a friend who is a member of Sarkozy’s press corps and of course I had to ask a whole bunch of totally inappropriate questions. Apparently Sarkozy only measures about 5’4 in socks and never leaves the house without four centimetre high lifts. And as for Carla “Jackie” Bruni–Sarkozy’s pregnancy, it turns out I may not be that far off the mark after all. It was apparently a better day today, although Franck was the one looking after our dear Clem. As a break from the colic I accompanied Charlotte’s class to an environmental-themed sports meet in Dijon that brought together 2500 elementary school children from local Catholic Schools. I thought to myself that the real miracle we should all have been praying for was not cleaner streams but rather all of the children returning to their own schools without anyone going missing or ending up in the wrong place. One of the ways I always used to know I had set foot in France was being enveloped in a welcoming cloud of cigarette smoke at Charles de Gaulle airport. That, and hearing the bleating “no smoking” message that was constantly broadcast through that very same airport, and which the nicotine-addicted French blithely ignored. Besides the odd ciggy at high school parties in what I am sure was a failed attempt to look cool, I have never been a smoker. I am addicted to many things – coffee, black chocolate, and most recently having my new house cleaner come once a week – but luckily for me I just never found cigarettes pleasurable enough to add to my list. So for years I considered putting up with smokey restaurants, parties, dinners, cafes, and airports in France as a necessary evil. I was in France after all, and everyone knew the French (including my husband) smoked like chimneys. Besides, I was in the minority. At dinner parties in Canada my husband was always the only one who smoked, whereas in France I was always the only one who didn’t smoke. I refused to be one of those self-righteous foreigners who insisted things be done MY way. So I soldiered on, coughed a lot, and developed a memorable case of asthma that year we lived in Paris. But something funny happened around ten years ago. First, my pack a day husband quit for the umpteenth time and much to everyone’s surprise it stuck. Then, we began finding ourselves at dinner parties in France with our formerly cig-puffing friends and would notice that no-one was smoking anymore. There were also a few babies crawling underneath the table that hadn’t been there before. It was undeniable. Smokers were becoming the minority in France, except in public places such as restaurants or cafes where France’s liberal smoking laws meant that you could cut a cube of air out of these places and it would be solid. However, as of January 1st this year I am happy to report that the new “no smoking in public places” law actually seems to be working. This isn’t, mind you, because the French have suddenly become a law-abiding people, but because the fines are insanely high. Hey, whatever works. During my recent afternoon out in Beaune with Camille we went into our favorite café, the Café Carnot and it took me a few minutes to realize that something was different; I wasn’t served up an asthmatic cough with my espresso. As we didn’t have to put up with a chain-smoking lady in a fur coat beside us, we lingered longer than we ever had. It was lovely. Even the ubiquitous dogs you find in French cafes look happier and more relaxed, especially because no-one would ever consider banning them. It’s a relief to see that France remains France, après tout. Joyeuses Paques from Burgundy, where it is currently snowing (! ), Franck is on his Sunday morning bike ride with Martial (in the snow), and Charlotte keeps exclaiming “Hallelujah! Jesus is resuscitated!” at random intervals. I knew that Rosary wasn’t as innocent as it looked. That’s Camille’s dark head hanging over her and Charlotte’s hand on the other side of the photo. I swear there was never a child who enjoyed such constant entertainment. We’re also off to Franck’s parents for Easter lunch, our third big meal out in the last three days, and I’m just about to make my first stab at making madeleines to take along with us. Alone with the three girls – one who is quickly bored in her jiggly chair, and the two older ones eager “helpers” – the feat should prove quite interessant. As long as I don’t poison anyone I’ll deem it a success. Happiness is all about keeping those expectations at a rock-bottom level. This entry was posted in Uncategorized on March 23, 2008 by admin. 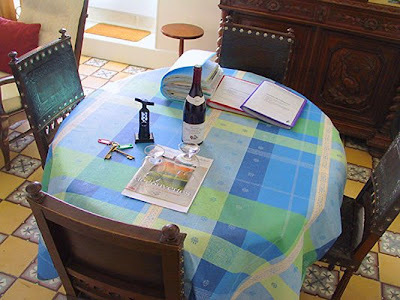 We have enjoyed a gorgeous winter here in Burgundy with mild weather and sunny blue skies almost every day. Today, however, Mother Nature is reminding us that she too can have her bad moods (although Eastern Canada certainly seems to be getting the brunt of those this year). We woke up to a stormy gray sky and sheets of rain and it hasn’t let up. So as an antidote I’m going to post a few more of my Saturday Beaune market photos to remind myself that contrary to appearances, Spring really IS just around the corner. Some saucissons with a very chic french woman strolling along behind them. …that looked so fetching I had to take another photo. And there isn’t just food. I always end up lingering over this stand of Burgundy-made pottery. Not to mention the baskets. Every self-respecting french person should have a favorite one to take to the market with them. And last but not least, this very lovely half-French, half-Canadian 8 year old striking a pose. This past Saturday was unbelievably gorgeous as warm – 16 degrees Celsius and a bright ball of sunshine in the sky. We decided to emerge from our winter / newborn hibernation and take Clémentine on one of her first outings to the Saturday Beaune market. If this photo doesn’t make you yearn for cauliflower (*ahem* Dad), I don’t know what will. Ditto for leeks and eggplant (*ahem* Dad, again). And to you men out there – when was the last time you offered the lovely demoiselle in your life some flowers? Camille and I got out for a little mother and daughter treat this week and of course I took her to my favorite treat place in Beaune – the wonderful pastry, chocolate, and ice cream shop called Chez Collard. The competition for the best pastries in Beaune is stiff indeed, but I think this place really does win the award for the most delectable creations. If you’re in Beaune, do yourself a favour and try one of their éclairs, réligieuses, figues, or my personal favorite, the bucheron (means “lumberjack” – must be my Canuck heritage coming out) which is a confection of meringue and chocolate ganache. The shop is just off from the market place on the pedestrian-only rue Monge. So what is the bad face part about, you are wondering? Don’t expect gracious service to go along with your treat. The lady who owns and runs the shop scares the living daylights out of her clientele. Not only is she reputed to have a face like une porte de prison (a prison door) but worst of all she has been known to refuse to sell pastries to people she dislikes. And one things she dislikes – I know because I’ve heard her balling out tourists for the crime – is people taking photos of her shop. So Camille and I embarked on a kamikaze photo mission after our treat. Quick Camille – smile! We spoke in English in an attempt to go undercover, although Camille’s very strong french accent may have been a strong give away. Got it! Then we run off so the Lady with the Bad Face won’t recognize us next time we come in for our Collard fix. This entry was posted in Uncategorized on March 17, 2008 by admin. Check out these wood and embossed leather chairs that are decorated with big metal studs. They always look to me like something plucked out of a medieval torture chamber. They go with the foot of the dining room table which is sadly covered up in my photo with the table cloth. This is a shame, because the table base is arresting to put it mildly; it is consists of a bunch of scary carved animal heads. I definitely wasn’t too hot on the dining room table and chairs when we bought the house, and would have been delighted if one of the seller’s children had taken them. But I figured if I covered up the table base with the table cloth I could live with them. The humongous living room buffet that goes with the table and which couldn’t be covered up with a tablecloth. As you can see, it is a singular piece of furniture that deserves a drum roll. This behemoth was my personal Waterloo. I loathed it at first sight. It was dark and had scary flying dragons with sharp teeth carved into it (see photo above) and birds of prey carved into the bottom doors (see below). It gave me nightmares. The fact that the seller’s children offered to sell us the furniture under the shadow of this buffet is no coincidence in my mind. It is frightening, even more so when you consider what moving it would entail. My intentions in regards to this buffet were crystal clear; I was going to take it to the antique dealer as soon as possible, sell it, then buy myself a french farmhouse piece with nice, clean lines to take its place. However, for the many of you who have stayed at La Maison des Deux Clochers over the past nine years may have noticed, it is still there. This is because a funny thing happened during those four months when Franck and I camped in the house and renovated night and day – the behemoth started to grow on me. First of all, Franck’s Mémé absolutely adored it, and would spend hours polishing it with bee’s wax. For her, this was the kind of furniture that was only found in rich people’s homes, so therefore the kind of furniture she only ever could dream about when she was a child. 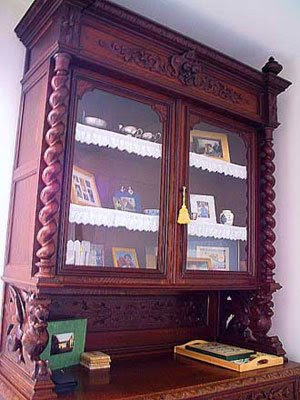 She would have been gutted if we had replaced it with some simple farmhouse armoire, the likes of which could be found in her house growing up, a place where there was a lot of love, but always too much work and too little money. Despite the fact that it had ended up being ours as a complete fluke, for Mémé this buffet symbolised that her grandson Franck had Arrived in the world. Secondly, our friend Alain who helped us do many of the renos on the house, and who happens to be an antique expert gave us some background on the piece. According to him, it dates back to the mid 18th Century and is made from pear and some other rare kind of wood that I can’t remember now. It is hand carved and all assembled with wooden pegs like a jigsaw puzzle – there is not a single nail in the whole piece. Alain also pointed out the tiny bubbles in the glass panes on the upper section. The glass was blown and hand-pulled. Alain, like Mémé, thought it was an exceptional piece. Someone had gone to great lengths to make it, and to make it well. Thirdly and most importantly, taking it to the antique store would require moving it, bringing us full circle back to the lumbago argument. So for the last nine years this buffet has continued to reign supreme in the living room of La Maison des Deux Clochers, just like it did for I don’t know how many years before we bought the house. I know from talking to guests over the years that it has its fans and its detractors, but funnily enough it has actually become one of my favorite pieces of furniture. I love it in the same way I love Neil Diamond. The quality is there, and it is so unashamedly true to itself that it comes full circle and become attractive in its unique kitschy way.